The Ferrari 308 GTB was the Italian marques first fibreglass car when it was launched in 1975. Styled by Pininfarina, it packed the 2927cc 255BHP V8 from the Dino 308GT4. The new look 308 GTB was an immediate success with the GRP bodywork making the car extremely light. 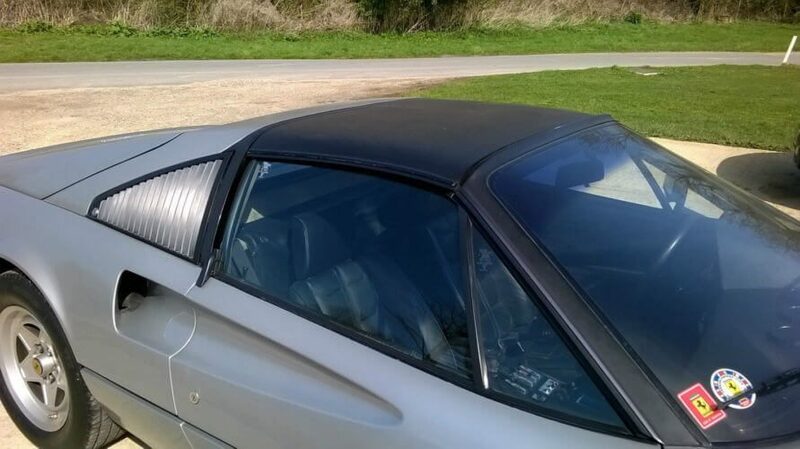 It also featured a removable targa top roof which transformed the cars appearance. 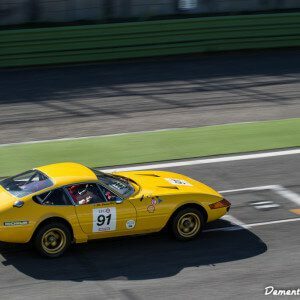 Despite Ferrari’s best intentions however, the GRP bodywork proved too slow and expensive to produce, so the 308 was bodied in steel instead. This resulted in a heavier body which hampered performance when compared to the earlier fiberglass bodied models. In 1980 the twin choke Weber carb engine was upgraded to Bosch Fuel Injection to help reduce emissions for the US market. 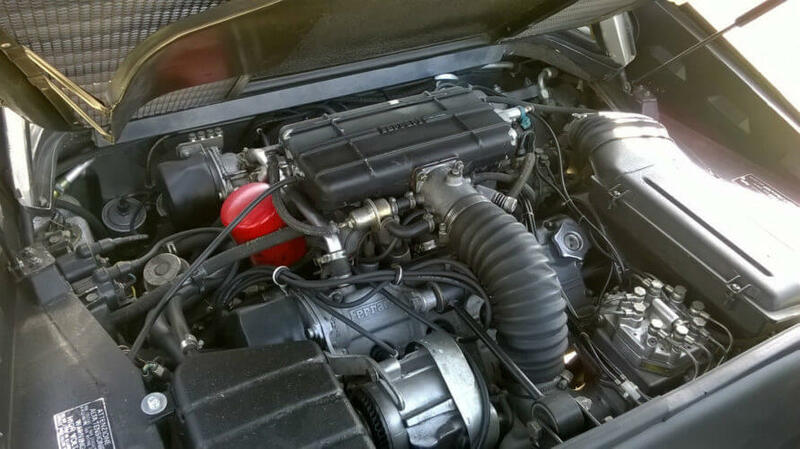 The 308 GTSi suffered a 40BHP drop in power as a result which impacted the performance. This performance drop was corrected in 1982 with the arrival of the four valve per cylinder engine shared with the Mondial QV model. With more than 12,000 variations built over its ten year life span, the Ferrari 308 GTSi was one of its most successful models and is still considered as one of the best entry level Ferrari’s money can buy. 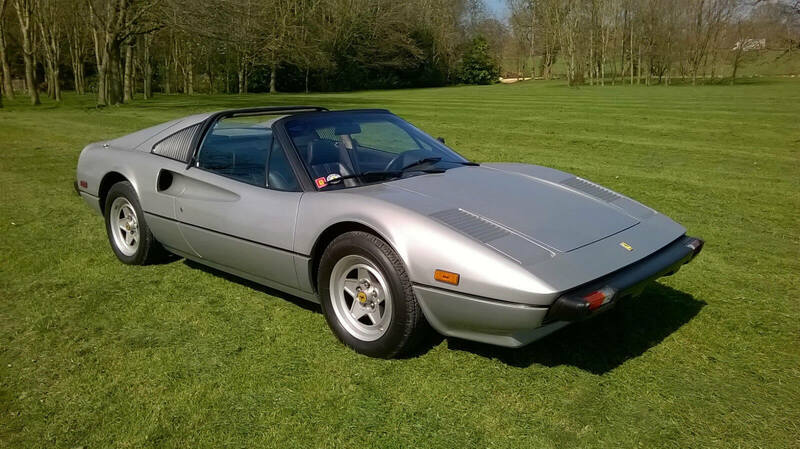 The Ferrari 308 GTSi on offer is a low miles, 1981 fuel injected model imported from sunny California. 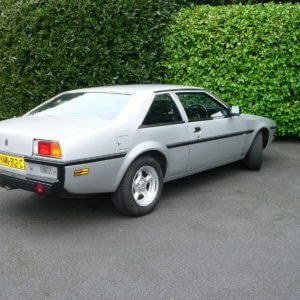 Finished in silver with a black leather interior, it is described as being in good original condition with no rust. It comes with its original toolkit and owners documentation including its California state emissions certification. The seller states it has had a full recent service, receiving new belts in 2014. Other work includes a new clutch, rebuilt callipers with new seals and pads, new rear discs and rear suspension bushes. The seller also notes that the Bosch Fuel Injection system has had new pipes and a service/rebuild. The interior is said to be in good condition and while the leather seats have suffered from the California sun, they have been treated which has revived them. The targa top is said to be in good condition as well and comes with its original targa bag. Exterior wise the seller states that it does require a repaint with crazing to the lacquer present. The owner hasn’t had it repainted as he likes the used look. He also notes that the wheels are good though could do with a refurb if the car was being painted. This 308 looks nice in silver. And the US spec bumpers don't stick out too far. For a change. The 308 has a great silhouette with the targa top off. And it still looks good with the top on. They are a great feature that transform the driving experience. 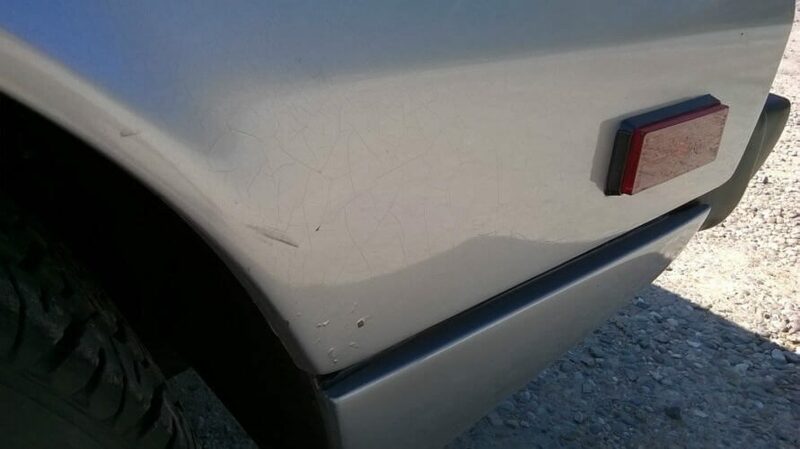 You can see the effect the sun has had on the paint. We'd tidy these stone chips before they take hold. The engine bay looks presentable. We'd get the fuel injection cover repainted and do a bit of detailing. But apart from that it looks good. 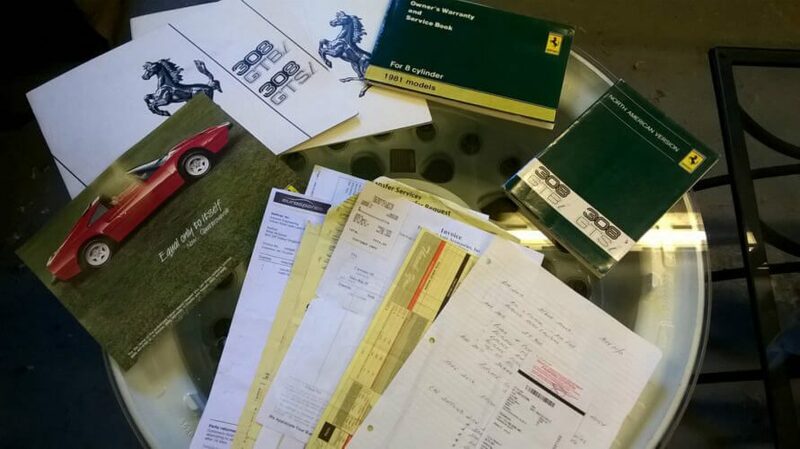 Always important, original Ferrari owners documentation. The Ferrari 308 GTSi is one of those iconic cars that summed up the 1980s. Even though it was launched in 1975, it has always been an 80s icon purely because of one thing, Magnum PI. Its hard to escape it really but as kids of that era, we wanted to be Tom Selleck. We wanted the house, the shirts, the car and probably even the moustache. While this Ferrari 308 GTSi isn’t red, its still is and always will be a Magnum PI Ferrari. We like the fact that this one is silver and not red. It makes a nice change. We also like the fact that this 308 GTSi presents itself as a daily driver. While its just under 37,000 miles hints at a garage queen, it clearly has been used. We’d sort out the wheel arch stone chips shown in one of the photos, but apart from that, we’d like to keep it original. With more and more Ferrari’s selling for record amounts, it is becoming harder to find the totally original ones that have not been restored back to garage queen standards. With its howling, high revving mid mounted V8, iconic gated manual shifter, targa top and those Pininfarina looks, this Ferrari 308 GTSi has a lot going for it. Even the US specs bumpers don’t look too bad, which is saying something. 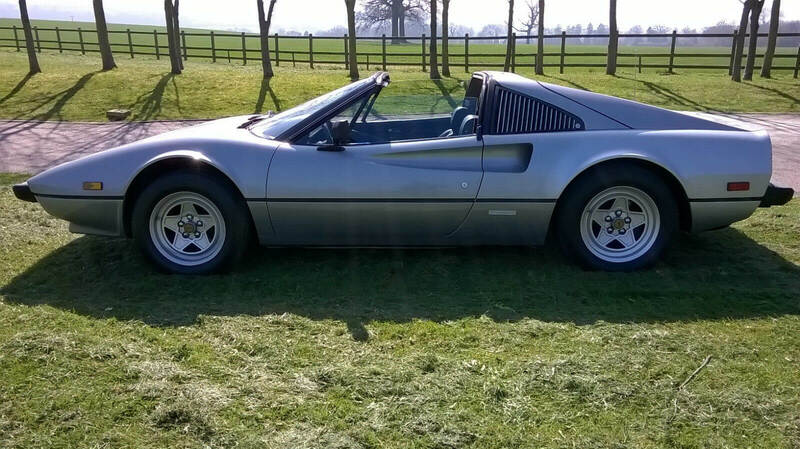 This Ferrari 308 GTSi is located in Blockley, Gloucestershire and the current bid is is £20,100 with no reserve.